Carly Watts Art & Illustration: Win a necklace! I thought it would be nice to do a little giveaway to say thank you to all of my followers! I really appreciate every single one of you, and your comments really do inspire me. I hope you will continue to read and enjoy my blog! You can follow me on Twitter right here! Good luck to all of you who decide to enter! She is lovely! And I like that she has pinkish hair. Great idea! This is so cool. Love this necklace and your blog! Oh my goodness enter me please! I found your blog just about a couple of months ago and since then I haven't stopped gagging at your illustrations. I reaaaaaaaally love them! 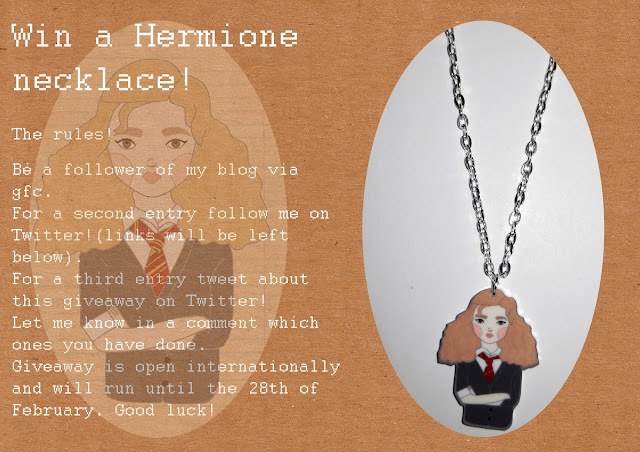 The Hermione one was the first I saw, so it would be awesome for me to have it on a necklace!